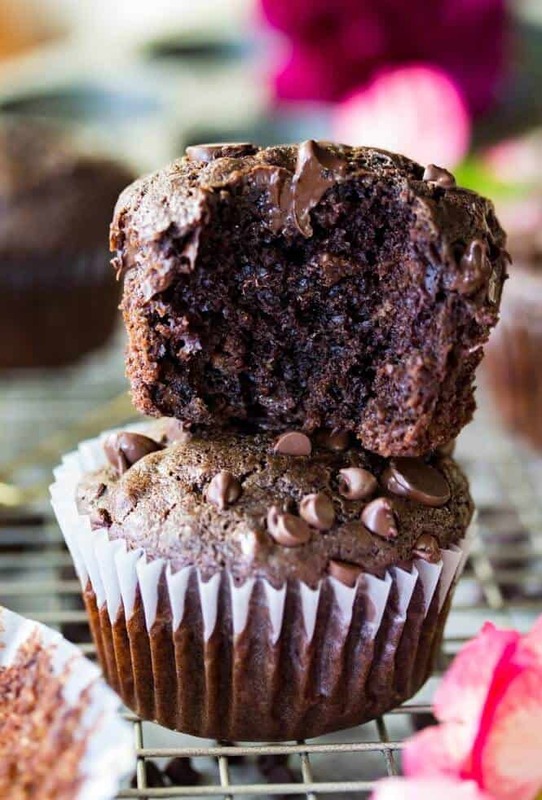 Better-than-bakery chocolate muffins! 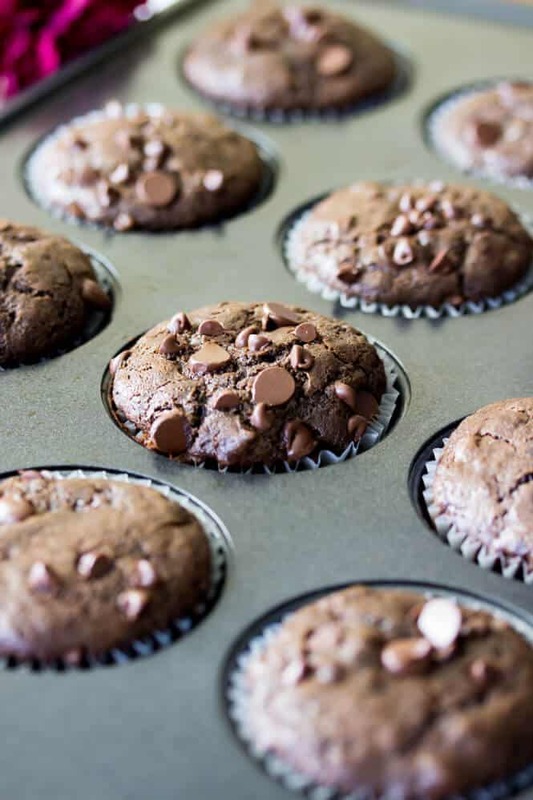 These richly chocolate muffins are made entirely from scratch using cocoa powder and chocolate chips. Read on for tips on how to get soft, fluffy muffins every time, and the key ingredients that make this muffin recipe crafted for perfection. On Monday I turned in my 2-weeks notice to my wonderful, fantastic job of over 4 1/2 years so that I can work full time on Sugar Spun Run. I’m an emotional melting pot of anxiety, excitement, elation and trepidation right now. “But what if the internet explodes?” Zach has rolled his eyes at that question roughly 6 million times so far, but here we are, and as nervous as I seem to be about the stability of the internet, I’m really happy to be here. I’ll publish a post in the future to go into more detail about how this all came to happen (and so quickly), but for now I just wanted to share that fun bit of news with you, and thank you from the bottom of my heart for following along with my blog (or just clicking over to this recipe from Pinterest or Google, I love that, too, you rock). But let’s get into what you really came here for — today’s recipe for double chocolate muffins. 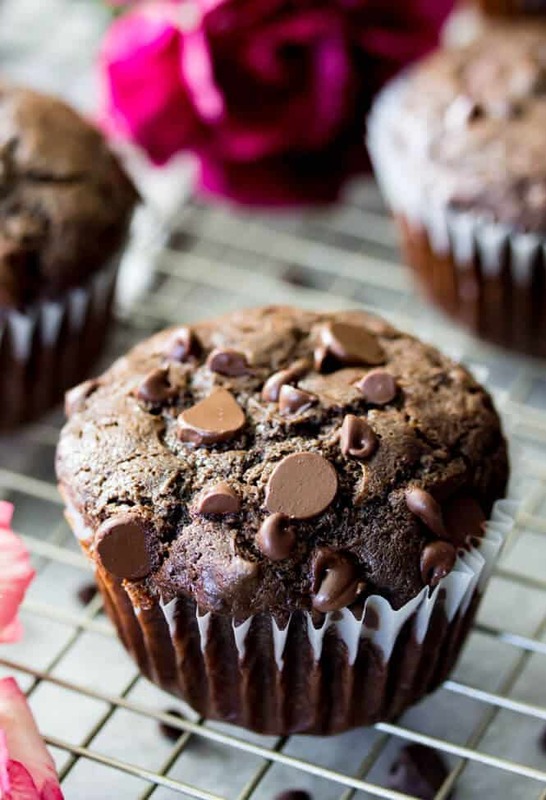 These double chocolate muffins are a very welcome recipe for a lazy morning. They’re entirely from scratch, but only take a few seconds to mix together, and the flavor is better than anything you can get out of a pre-packaged pouch. To attain this perfect texture and flavor, we actually are going to use oil instead of butter here. As with my chocolate cupcake recipe the cocoa powder and chocolate chips (and other ingredients, more on that below) provide more than enough flavor to stand alone. Because butter actually has a certain percentage of water in it, it actually can dry out our muffins where oil keeps them soft and moist, but sometimes is necessary to use anyway to attain a desirable flavor. Here, we have plenty of other elements contributing to the flavor of the muffins, so we can nix the butter and use oil for fluffy, flavorful muffins, no butter required. We also use sour cream, which (very subtly) adds to the flavor of the muffins, but more importantly also helps to keep them nice and moist. As you may be able to tell in the above photos, this chocolate muffin batter isn’t super smooth, it’s a little lumpy, and that’s not just because of the excessive amount of chocolate chips that we’ve stirred into the mix! 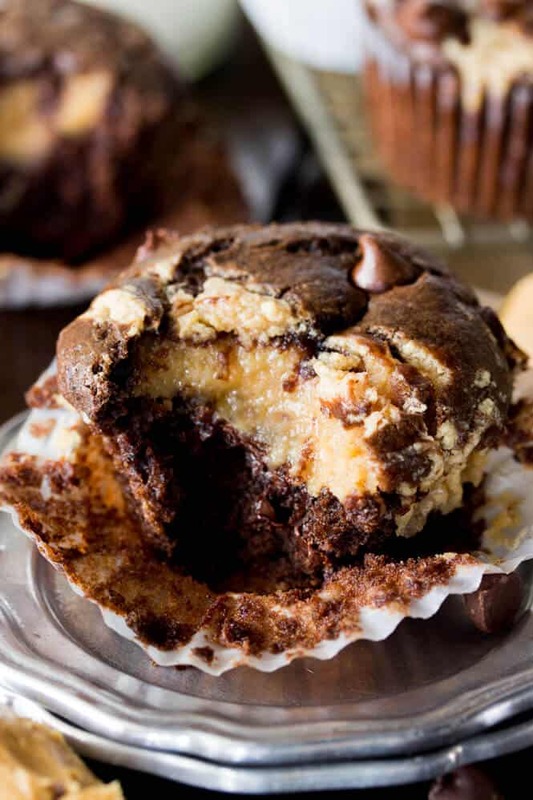 It’s because the batter has been mixed just enough, which, in the case of these chocolate muffins (and most muffins) means never, ever over-mixing the batter. Doing so usually results in tough, dense, dry muffins that don’t rise above their muffin liners. 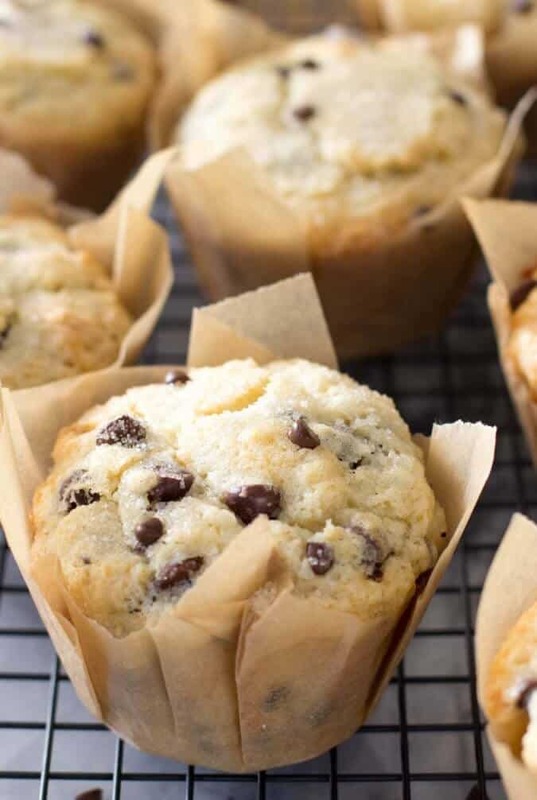 Since we’re already topping these muffins off with some fairly heavy chocolate chips, we don’t want to do anything to the batter to keep it from rising. So, yeah, a few dry lumps in the batter are totally OK here. That’s all for today, but if you’re wondering how/if things are going to change around here now that I’m no longer going to be spending 50 hours a week at my day job, they absolutely are (in a good way! ), though a lot of it will be behind-the-scenes at first. Within the next month or so I’ll be bumping up the number of posts that I’m publishing each week, working on a lot more video, and probably dabbling on Facebook Live. Speaking of which, how do you feel about Facebook Live? Do you ever watch them? What recipe would you like to see made first?! If you’re not already, you can follow me on Facebook here. Full recipe just below the video. 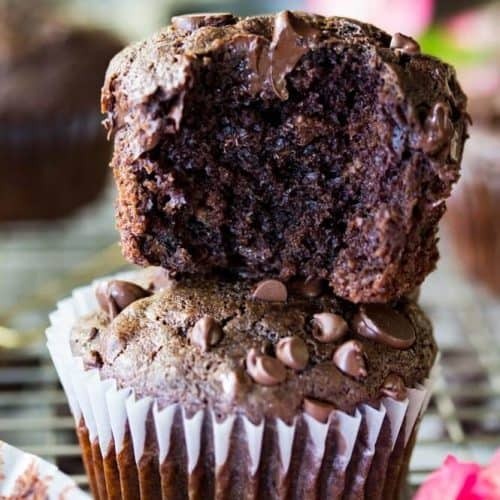 Better-than-bakery chocolate muffins! These richly chocolate muffins are made entirely from scratch using cocoa powder and chocolate chips. Preheat oven to 375F (190C) and line 18 muffin cups with cupcake liners (or lightly grease and flour). In large bowl, whisk together oil, sugar, and milk. Stir in eggs and vanilla until well-combined. Gently fold in sour cream until just-combined. 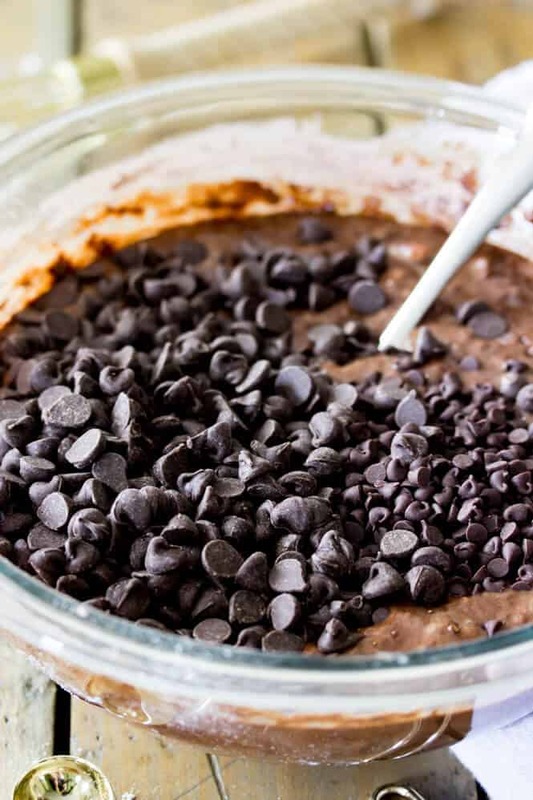 In separate, medium-sized bowl, whisk together flour, cocoa powder, baking soda, and salt. Fold flour mixture gently into wet mixture, folding until just barely combined. Stir in 1 1/2 cup chocolate chips. 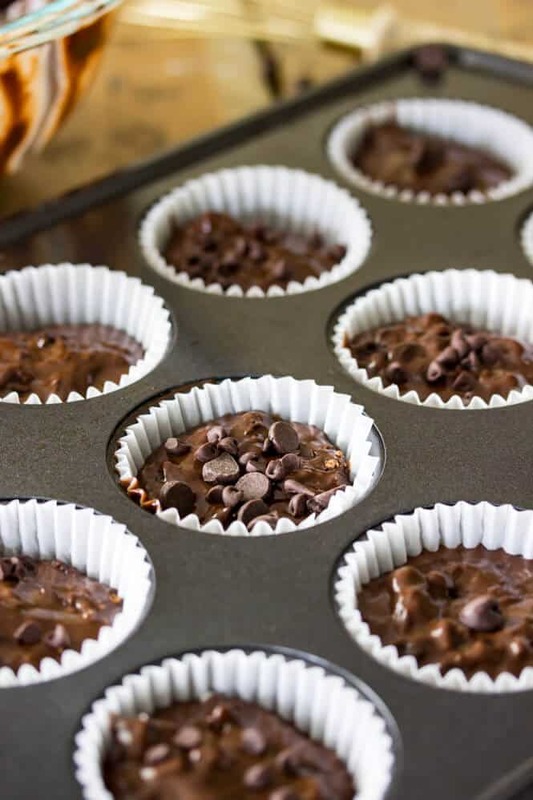 Scoop chocolate muffin batter into prepared muffin tin, filling 2/3-3/4 of the way full. Sprinkle tops of muffins with remaining chocolate chips. Bake on 375F (190C) for 18 minutes (toothpick inserted in center should come out with few slightly fudgy crumbs. Loved them! I made 12 extra large muffins and they turned out great! Just a note for anyone using grams/ not in the US, 2 cups of flour is 300g not 240g. These are delicious! Made no changes although some of my chocolate chips were peanut butter because it was what I had on hand and they came out perfectly! Thank you! Great recipe, perfect amount of chocolate flavour & very moist! This recipe is a keeper😊 I like that you can just mix it by hand, only took a few minutes( except for the dishes😕) I wish you all the best with your full time blogging, judging by this recipe I am sure that you will suceed! My kids ask me to make these for breakfast every week! They are so delicious and easy. We make giant bakery muffins and smaller ones. Wonderful recipe. Thank you. Hi Chris, how do you make the giant bakery muffins? I also want to make them! I have a regular medium sized 16 muffin tin. Thank you so much for posting this delicious breakfast treat!!! Followed the recipe exactly as written and they were amazing! My son requests them weekly. I will never need another double chocolate chip muffin recipe!! That’s…. really odd… they shouldn’t be bitter. You didn’t leave the sugar out by chance did you? Or accidentally use too much cocoa powder or baking soda? Sorry to hear they weren’t a hit for you! No ma’am. Followed it to the “T”. 🙁 maybe the cocoa powder because it’s the baking kind? Disappointed…I followed recipe exactly and, because they were not done in 18 minutes, I gave them another three minutes. Now that I’ve taken them out and they’ve cooled, they have all fallen in the middle, as though not fully baked. Hi Kim! Did you give the oven ample time to preheat before adding the muffins? If so I’d wonder if your oven temperature is not accurate, sounds like it’s running colder than it’s telling you and that may be why the muffins took longer to cook and then sank. Just made your muffins this morning for breakfast and a Valentine’s Day treat. They turned out beautifully! Made them with gluten free flour, coconut oil, and coconut sugar. Needed something sweet with what I had on hand and your recipe was the one. God bless you! will it work if i made it in a small cake pan instead of muffin tins? Hi Gabby! You should be able to, but I don’t know what a baking time would be for that. Could you substitute yogurt for the sour cream?